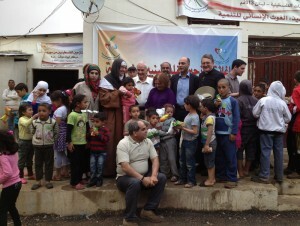 Palestinian Refugees play host to new Syrian arrivals! 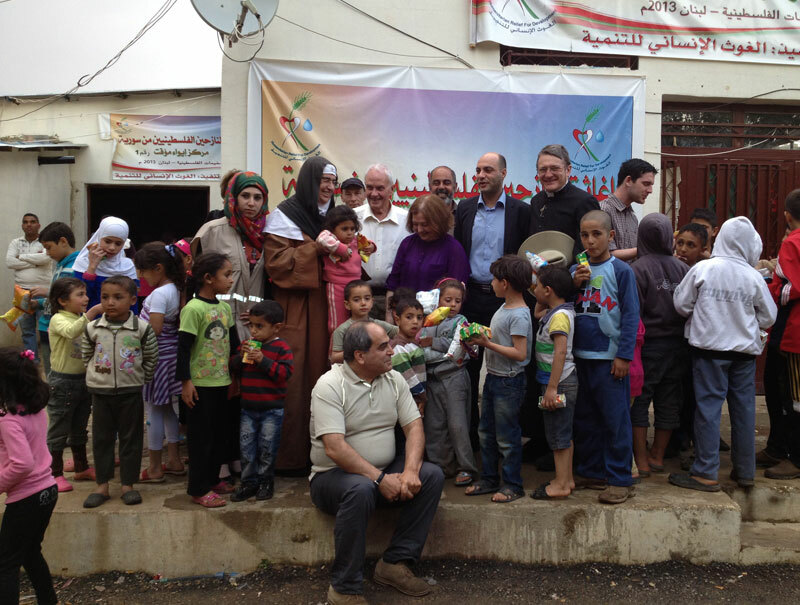 We visited the refugee camp in Baalbek, near the Lebanese/Syrian border in the first week of May, 2013. The camp has been housing around 4,000 Palestinian refugees, mainly from the Galilee area, for more than a generation. In the last two years though they’ve had to cope with an influx of 7,400 Syrian refugees! The Palestinians of Baalbek are simply an inspiration, though it’s hard to know how long these people can continue in this impossible situation. One small contribution I think we could make is to run some boxing camps for the young people during their summer holidays. I think Denning would be the ideal person to manage it! Does anyone else want to volunteer? The first video is Luke Waters’ coverage of the camp, screened for SBS TV. Luke was a valued member of our team until his employer said that he couldn’t join us on our trip into Syria (or so I was told)! 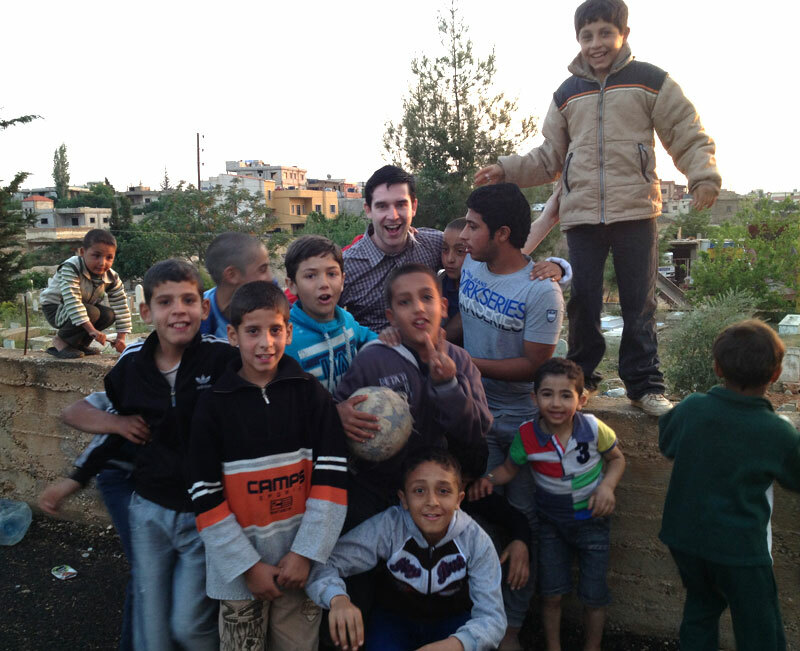 Tags: delegation, father dave, palestinian refugees, palestinians. Filed under Israel and Palestine by Father Dave on May 11th, 2013. 2 Comments. Israeli settlers assault UN delegation! The whole truth is coming out about the situation in the Holy Land. The truth is coming out too slowly to suit a large and growing number of people, but the truth is coming out surely, nevertheless. You and I can help to educate the public by circulating pertinent news reports like the one pasted below. This report reflects a peculiar antisocial attitude which needs to be recognized for what it is and illuminated. When we share what we’re learning with our friends and neighbors … without imposing what we’re learning on them … we thereby help to hasten the end to a great deal of international, highly personal suffering. God seems to be working His purpose out in the Holy Land today. We’re all of us a part of it. Jerusalem has a way of changing people. It’s going to take the whole truth to set all of us free. The two highlights in the following news report are mine. Al Qassam website – Jewish settlers threw stones and rubbish on a number of foreign law professors, who are participating in a conference about Palestine’s membership in the U.N. which is being held at al-Khalil University, while they were touring the old city near the Jewish settlement of Beit Hadasa. The delegation visited the old city over two days to see how the Israeli occupation soldiers and Jewish settlers deal with Palestinians. They were guided by Muhammad al-Jarbeeni, a lecturer at the university and an activist in defending al-Khalil, to see for themselves the measures and restrictions against Palestinian residents in the old city, the rough treatment by the occupation army and the harassment by the settlers. The visiting delegation were also briefed on the closure of Shuhada street and the effect it is having on the local residents and the residents of Tel al-Romaidah. Lecturer and researcher at Oxford University, Abbas Sheblaq said that the situation in the old city is a clear proof of the fascistic way used by the occupation to uproot Palestinians and the Israeli mentality which aims to eliminate the other. He further described the occupations practices in al-Khalil as worse than what the defunct apartheid regime’s practices in South Africa, adding that what the media relates about the practices of the occupation and its settlers does not exceed 5% of the facts there. For his part, Guy S.Goodwin-Gill, Senior Research Fellow at All Souls College (Oxford University) said that he has been to many areas of armed conflict around the world, but he has never seen anything like what he saw in al-Khalil’s old city. Filed under Israel and Palestine, israel and palestine articles, israel and palestine conflict by Father Dave on Apr 23rd, 2012. Comment.